The Skyforge is an ancient forge capable of forging unique weapons and armor. It is currently tended by the greatest blacksmith in Skyrim, Eorlund Gray-Mane. Its heat is used to forge powerful weapons and light the funeral pyres of fallen Companions. The Skyforge is often linked to the sun, and the secret Underforge beneath is the metaphorical moon, due to its association with werewolves. 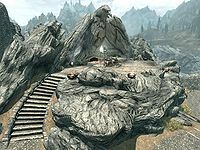 Legend tells that the Skyforge has existed since before the area was inhabited. According to the Songs of the Return, the local elves believed it to be a relic of the gods, and consequently gave the area a wide berth. 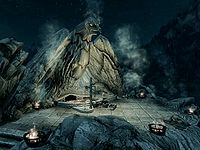 Ysgramor and his Companions, however, were quick to claim the Skyforge as their own once they discovered it, and they built their headquarters, Jorrvaskr, here. After this, others started settling, eventually forming what is now the city of Whiterun. Working at the Skyforge is like working at any other forge. All items that can be crafted at normal forges can also be crafted at the Skyforge, subject to the same Smithing perk restrictions. However, additional crafting options are added to the Skyforge after completing the quest Glory of the Dead at the end of the Companions questline and talking with Eorlund. "Nord Hero" weapons show up in a new subsection called "Draugr" and "Ancient Nord" armor shows up in the "Daedric" subsection. These items can only be crafted at the Skyforge, but do not require that any Smithing perks be unlocked. Version 1.2.7 of the Unofficial Skyrim Patch moves the Ancient Nord armor under the "Steel" category, and makes both weapons and armor require the "Steel Smithing" perk to forge. Although you cannot craft them, Skyforge Steel weapons are available from Eorlund after joining the Companions in Proving Honor. Eorlund gives you one free weapon, but others can be purchased from Eorlund (along with wolf armor). They are elven-tier in damage, but steel-tier in weight and smithing. 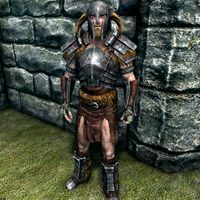 Ancient Nord armor is low-quality heavy armor, providing the same amount of protection as iron armor with slightly less weight. All items can be tempered using 1 iron ingot, and having the Daedric Smithing perk doubles the quality improvement. It can also be found in some Nordic ruins; in particular, it's commonly available in Forelhost. There is no Ancient Nord Shield. †Due to an incorrect keyword being set, these gauntlets do not add their base armor value of 10 to unarmed damage. Instead, in the base game, they add 18, because they are misclassified as Daedric, and with the Unofficial Patch, they add 12, because they are misclassified as Steel for the purposes of the perk. The correct setting for 10 damage would be Iron (this is a perk specific keyword that does not interact with smithing). The Skyforge allows you to convert standard draugr weapons ("Ancient Nord" weapons) into improved "Nord Hero" weapons after completing the main Companions questline and speaking to Eorlund. This can only be done using standard ancient Nord weapons, not the improved honed ancient Nord weapons that appear at higher levels. Daggers, maces, and warhammers are not available. The source weapons can generally be obtained in large quantities in any Nordic ruin or other Draugr Crypt. The resulting weapons are all medium-quality weapons, with damage identical to elven, Nordic, or Skyforge steel weapons. However, they are also the lightest available weapons (tied with iron), making them the best option of the four due to lower stamina costs for melee weapons and faster draw time with the bow. All of the weapons can be tempered using 1 steel ingot (see bug). Having the Steel Smithing perk doubles the quality improvement. While these weapons can only be made at the Skyforge, they can be improved with any grindstone. If you've completed the Companions questline and still can't forge Nord Hero weapons, talk to Eorlund. He should mention how "the Skyforge feels more... awake." † Nord Hero Arrows are only available in the game if using the Unofficial Dawnguard Patch. They can be created in batches of 24 using an equal number of Ancient Nord Arrows and 1 Steel Ingot. The patch alters their damage to 16 instead of 24. The All ForgeCC added by the Myrwatch Creation can be used to craft items usually restricted to the Skyforge. The Skyforge also appeared in Legends, with the addition of the Heroes of Skyrim card expansion. The Nord Hero bow cannot be tempered. Even with the Dawnguard add-on installed, it is still not possible to craft Nord Hero arrows. This bug is fixed by version 1.2.3 of the Unofficial Dawnguard Patch. 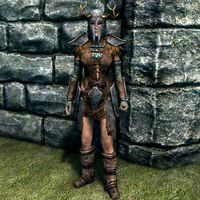 When playing a female character, the Ancient Nord Helmet has the female appearance outside the inventory. Since the vanilla mannequins are male, the helmet cannot be seen when put on a mannequin. This page was last modified on 15 April 2019, at 01:05.